Normally $160, get both courses for $99. Please click on each module below for detailed descriptions of what is included. First, you need to enroll in the courses by clicking on the link at the beginning or end of this page and going through the check-out process. Once you are enrolled, you will gain immediate access to the online classroom. You will see a list of your 2 courses and can click on any of them to get started. Each course contains sequences of techniques that are presented through video and written materials. All of the material is presented in step-by-step directions that are easy to follow. If you have questions on anything, you have several options where to get input. First, there is a section underneath each video 'lesson' where you can write your questions. You can also chat to us & other students on the course facebook page. If you are shy to share your questions with the other students, you can send us a private email us at any time. There is no hurry to move through the courses - you can move through the materials whenever you like. Some people 'binge watch' while others go through things more slowly when they have the time and inclination. You can even download the videos so that you can listen/watch on the go.The courses are your resources to use for years to come for learning, review and inspiration. Download a copy of this shiatsu classic by Saul Goodman and help family & clients recover health. Shiatsu puts the tools of health into your own hands. You are subscribed! Now check your email to confirm your email and get your free digital of The Book of Shiatsu. Who takes our online courses? These online courses are for practitioners who want to learn shiatsu shin tai bodywork with Saul Goodman. Many people use them to supplement their shin tai training, while others use them to begin a study of this unique work. Whether you do massage, shiatsu, craniosacral, chiropractic, or physical therapy, this course can increase the effectiveness of techniques that you already use, and also add new ones to your repertoire. Thousands of bodyworkers all over the world have studied with Saul Goodman in order to learn this powerful way of evaluating and treating the body. Your classes are always easy to follow; everything makes sense. And your connection to the whole being that we are interacting with is so inspiring. Learning from you live in a classroom is terrific, but what I'm appreciating about this video class is the ability to repeat exactly what you just said (several times if I need to). Thank you for this wonderful module. It is a great resource! These videos give a real sense of the energy and the truly transformational nature of this work. Very exciting. Learn shiatsu with this beautifully detailed book that has nearly 300 clear photographs and illustrations. The Book of Shiatsu provides simple step-by-step instructions for whole body shiatsu. Plus you get info on acupuncture points for common ailments, dietary suggestions & different diagnosis methods. We can help you create a thriving practice. 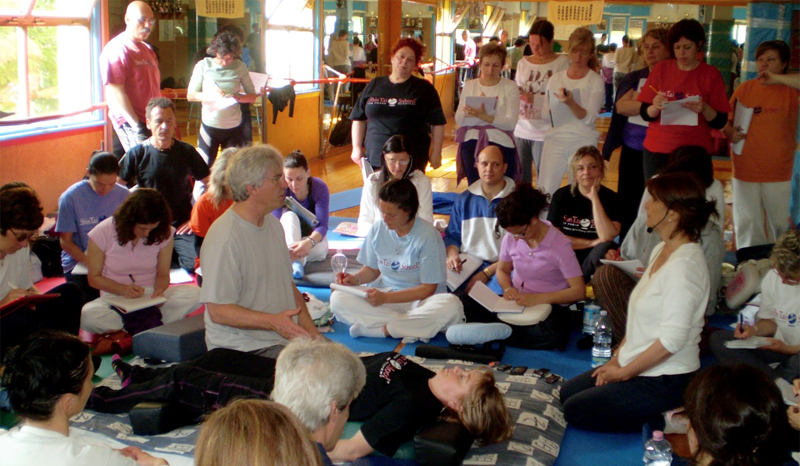 These courses are for you if you have an interest in learning traditional and contemporary shiatsu abdominal treatment. The materials presented provide a powerful protocol for increasing the health of your clients and offering them a unique level of healing. I already have a bodywork practice (massage, shiatsu, craniosacral, chiropractic, etc.). Will this course bring anything new to me? Most students who take our online courses are already bodyworkers. The unique theory and application of technique in Shiatsu Shin Tai can add to your repertoire and increase the effectiveness of the modality you already practice. In other words, you will learn ideas which can be applied to many kinds of technique and treatment. Plus, you will learn new techniques which can be integrated into your treatments. I have already taken live classes in hara treatment with Saul or another Shin Tai instructor. Will this course contribute anything new to my understanding? These courses covers material generally given in the first days of the Shin Tai class 'Conception Vessel/Hara.' So if you took that class, most of the techniques will not necessarily be new for you. Many of them will be presented with new variations. Having them presented on video so you can watch them again and again does provide an opportunity for you to understand and remember the material better. And if you adopt a beginner's mind, you may find you learn new things about each technique that you may have missed in class! The main value lies in the observation of the treatments themselves. To watch the techniques and the response in the receiver is one of the best ways to absorb a deeper understanding of what Shiatsu Shin Tai bodywork is all about. Take your time to observe Saul's technique and how he works with the body. It will pay off in increasing your skills, perception, and results. The course starts now and continues for years. It is a completely self-paced online course - you decide when you start and when you finish. After enrolling, you have unlimited access to this course for as long as you like - across any and all devices you own. We expect to maintain this course site for many years to come. Hara treatment is one of the most effective ways to improve someone's condition. By applying the techniques in this course along with its unique theory, practitioners report that they can create more change with less effort for their clients. They find fulfillment in helping others increase health and emotional well-being in a natural way. Rather than acting as a 'healer' who 'changes' things that are 'wrong', they instead facilitate the flow of a receiver's own life force to do the work of healing. So many people are struggling with physical, emotional and mental challenges. The barrage of stress factors that introduce compression into our systems seems to be escalating. Learning efficient, powerful techniques to open up the flow of life force is a potent opportunity for you to help shift someone toward vitality, rather than disintegration and deterioration. Bodywork is a critical point for expanding health and consciousness on this planet, and you can be a part of this movement towards a higher frequency of human functioning. If you are not satisfied in any way with this course, just let us know within 30 days and we will send you a full refund.